As the summer playground to many of America’s wealthiest families, Newport was once a swirl of couture dresses in a seemingly endless string of balls and entertainments. The Preservation Society of Newport County’s annual costume exhibition at Rosecliff (1902) this year highlights 20th century fashion and the way designers marketed changing styles and silhouettes to American consumers. The 11 dresses on exhibit are among the finest garments in the Preservation Society’s collection, from designers such as Chanel, Givenchy and Halston, among others. Among the highlights of the exhibit is a 1925 evening gown by Callot Soeurs of Paris. With its straight profile, this evening dress epitomized the style of the period. The increasing popularity of automobiles and dance crazes such as the jitterbug necessitated shorter hemlines and ushered in a new silhouette for the 1920s. Heavy corsetting and layers of skirts were out, girdles and bras that flattened out the figure were in. From the late 1930s to the mid ’40s, dresses were back to having a more defined waist and fuller skirt to emphasize the female figure. The exhibit includes a 1941 tea party dress made of cotton organdy which demonstrates this style. Additional highlights include a 1965 red skirt suit by Chanel, a 1985 cotton organdy pant suit with glass beads by Halston, and a wool cocktail dress by Givenchy from the 1990s. The Preservation Society’s costume collection helps to trace the changing role of women in American society over the centuries. The creation of one-of-a-kind garments, known as haute couture, has represented the pinnacle of high fashion since the 19th century. The allure of haute couture still captivates the imagination today; however, due to dwindling markets, collections now include fewer pieces than they did in the early 20th century. Beginning in the 1960s, designers licensed their names for use on products and expanded their own lines beyond apparel. At the same time, the retail clothing industry diversified, providing more options at different price points. Today, haute couture collections no longer set the standards for how women should dress. Instead, they have evolved into marketing tools that shape a designer’s “brand” and increase sales of affordable products. Some devotees still buy haute couture clothing, but it is a shrinking population. The exhibit is on display in the Lesley Bogert Crawford costume galleries on the 2nd floor of Rosecliff through November 22. Admission to the exhibit is included with any Rosecliff tour ticket, including multi-house tickets. Rosecliff is open daily for tours from 10 a.m. to 5 p.m. through November 22, except when it is closed for the Newport Flower Show June 20-23. Newport Mansions tickets can be purchased online at www.NewportMansions.org, or in person at any Preservation Society property. Authentic 19th century coaches drawn by matched and highly-trained teams of horses will return to Newport from August 16-19, 2012, in the triennial renewal of a Weekend of Coaching, hosted by The Preservation Society of Newport County. A gala dinner-dance in honor of the whips will be held at The Breakers © 2012 Karen Rubin/news-photos-features.com. Authentic 19th century coaches drawn by matched and highly-trained teams of horses will return to Newport from August 16-19, 2012, in the triennial renewal of a Weekend of Coaching, hosted by The Preservation Society of Newport County. The public will enjoy free viewing of the colorful and historic coaches every day, as they drive through the streets of Newport and the grounds of the Newport Mansions, celebrating and preserving a century-old sporting tradition. The drivers, or “whips” as they are referred to in the sport of coaching, who are expected to attend are: Mr. S. Tucker Johnson, of Hobe Sound, Florida, President of the Coaching Club; Dr. Timothy J. Butterfield, of Derry, New Hampshire; Frederick E. Eayrs, of Middleboro, Massachusetts; Walter F. Eayrs, of Bristol, Rhode Island; Howard Fafard, of Framingham, Massachusetts; John Frazier Hunt, of Spring City, Pennsylvania; Herbert Kohler, of Kohler, Wisconsin; James Mather Miller, of Lakewood Ranch, Florida; Sir Paul & Lady Sarah Nicholson, of Durham, United Kingdom; Louis G. Piancone, of Gladstone, New Jersey; Claire Reid, of Southern Pines, North Carolina; Sir John Richards, of Cheshire, United Kingdom; Harvey W. Waller, of Stockbridge, Massachusetts; George A. Weymouth, of Chadds Ford, Pennsylvania; and John White, of Newton, New Jersey. The routes of the daily drives will be published in the local press and the Preservation Society’s website (www.NewportMansions.org), along with suggested viewing spots. In addition, there will be a free-to-the-public driving exhibition on the grounds of The Elms starting at 10:30 a.m. on Saturday morning, August 18. The weekend will culminate with a formal Coaching Dinner Dance at The Breakers on Saturday evening. The Honorary Chairs of A Weekend of Coaching are Mr. & Mrs. A. L. Ballard. David E.P. Lindh is the Chair, and Kenneth M.P. Lindh the Vice-Chair of the Weekend. Frederick E. Eayrs is Vice-Chair of Coaching. The Chairs of the Coaching Dinner Dance are Mrs. Mark (Leslie) Hull; Mrs. David E.P. (Lynda) Lindh; Mrs. Kenneth M.P. (Elaine) Lindh; Mrs. David J. (Beverly) Little; Gladys V. Szápáry; and Mrs. Guy F.C. (Mary) Van Pelt. Tickets for the dinner-dance in honor of the whips at The Breakers are $450 per person, and reservations are required. For more information and to purchase tickets, visit www.NewportMansions.org, email Events@NewportMansions.org, or call (401) 847-1000 ext. 140. The tradition of coaching grew out of the 18th and 19th century mail runs in England, which later made their way across the Atlantic to the United States. The horse-drawn mail coaches were eventually replaced by railroads, but nostalgia led to the development of coaching as a sport. The Coaching Club of New York was formed in the latter part of the 19th century, eventually becoming part of the social fabric of Newport in the summer. The Wetmores, the Bells, the Vanderbilts and the Belmonts were all active members, bringing their coaches together to go to the races, the polo games, and the Casino. The two types of open-air vehicles used in the sport of coaching—a Road Coach and the slightly smaller Park Drag—employ a team of four horses. All seating is outside, with the driver, known as a “whip,” sitting in the slightly elevated right front seat, and the whip’s wife or female relative taking up the “box seat” on the left. The rear bench of the coach holds at least two specialized footmen called grooms. Two center benches can hold up to 10 passengers. The Preservation Society of Newport County, Rhode Island is a non-profit educational organization accredited by the American Association of Museums and dedicated to preserving and interpreting the area’s historic architecture, landscapes and decorative arts. Its 11 historic properties—seven of them National Historic Landmarks—span more than 250 years of American architectural and social development. 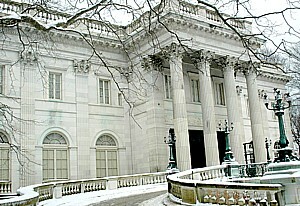 For more information, call 401-847-1000 or visit www.NewportMansions.org. 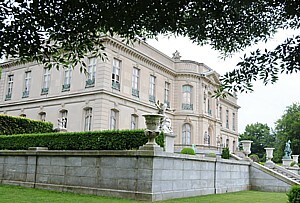 The Elms, one of the Newport Mansions of the Gilded Age © 2012 Karen Rubin/news-photos-features.com. The Preservation Society of Newport County’s annual costume exhibition at Rosecliff (1902) this year features highlights from its collection of historic clothing, several of them never-before-displayed. The Victorian Wardrobe Revealed: 1840-1900 exemplifies the best of the Preservation Society’s collection—fine materials, expert craftsmanship, and a wealth of interesting stories about the societies in which they were created and worn. The exhibit is open through November 16. Arranged chronologically, each garment reveals a story about fashion history and production. For example, visitors can trace the changes in women’s dress silhouettes through the 19th century, from the low shoulders and full skirts of the 1840s and ‘50s, to the nipped waists and bustles of the 1880s. Women achieved each of these shapes by a combination of the construction of their dress and an ever-changing array of undergarments beneath it. These understructures – including crinolines, hoop skirts, and corsets – existed well before the 19th century, but became integral components of the Victorian woman’s wardrobe. The exhibition also traces developments in the way clothing was manufactured and purchased. In the early 1800s women often made their own clothing or commissioned it from a seamstress. Department stores emerged by the middle of the century, offering broad inventories of fashionable ready-made clothing at affordable prices. For the luxury consumer, the couture industry developed in Paris during the 1860s, with high-end workshops providing a glamorous alternative to small-scale local dressmakers. The textiles on display encompass the full spectrum of this progression, including skillfully handmade 1840s day dresses, a tea gown by the Providence dressmaker Jennie Carr, and capes from both the Liberty department store in London and the Parisian couturier P. Barrion. Another highlight is a black and white striped gown by the couture house of Charles Frederick Worth, donated to the Preservation Society by Alice Brayton of Green Animals. It required over 300 hours of conservation work to prepare it for display. This gown is an excellent example of the bold fabrics used by high-end couturiers, and hints at the fashion-forwardness of women who patronized these designers. Other noteworthy examples include a simple Quaker dress handmade from a luxurious but understated brown silk, and a uniquely-draped example of Victorian mourning fashion. Co-curated by Jessica Urick and Rebecca Kelly, the exhibit is on display in the Lesley Bogert Crawford costume galleries on the 2nd floor of Rosecliff, 548 Bellevue Avenue, Newport, through November 16. Admission to the exhibit is included with any Rosecliff tour ticket, including multi-house tickets. Rosecliff is open daily for tours from 10 a.m. to 5 p.m. through November 16, except when it is closed for the Newport Flower Show June 21-24. Newport Mansions tickets can be purchased online at www.NewportMansions.org, or in person at any Preservation Society property. 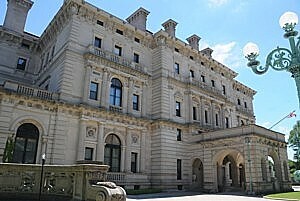 The Breakers, The Elms, Marble House, Chateau-sur-Mer and Rosecliff are open daily. Plan your visit now.